Geth is a large, attractive house in Cheydinhal. 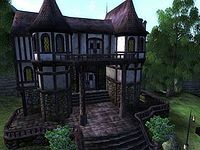 It is owned by Voranil and is the venue for some of the most exclusive parties in Cyrodiil to which, unfortunately, you will never be invited. Helping to run the house is a staff consisting of Maknok gro-Coblug, the groundskeeper; Rogmesh gra-Coblug, the cook; Tanasa Arano, the charwoman, and Tolisi Girith, the maid. Tanasa and Tolisi both have a deep, dark secret. Upon entering the ground floor of Riverview, you will find yourself in a brightly lit, lavishly decorated room. To the right is a dining area, containing a dining table laid with silver cutlery, apples, cheese, and a selection of wines. There is also a collection of storage containers: a small chest, a grain sack, a cupboard, a barrel, and a sack, all containing random clutter, and a cupboard stacked with silver cutlery. To the left is another, smaller table, laid with two bread loaves, some strawberries, and a selection of silver cutlery and utensils. The first floor of Riverview contains Voranil's bedroom, and some very interesting clues about his lifestyle. On the upstairs landing is yet another table containing three bottles of Tamika's West Weald Wine, one bottle of Surilie Brother's wine, some silver cutlery, and three bottles of Skooma. There is also an abundantly stocked wine press. Inside Voranil's bedroom are a red silk robe and a green silk doublet, carelessly thrown on the floor, two cupboards containing clothes, two potions on-top of the cupboard, and a bedside table cluttered with two bottles of wine, a jewelry box, and two more bottles of Skooma. Beside the bed is a chest containing clutter. There is also a painting area complete with brushes, paint-brush jars, a painting palette, and some canvases. The basement of Riverview also serves as a Servant's Quarters. The room is a typical basement, containing five barrels, six crates, three cupboards and one chest, all containing random clutter. 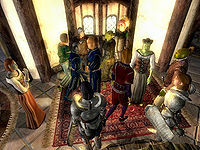 There is also a servant's dining table, stocked with five sweetrolls, and three portions of Shepard's pie. There are three beds belonging to the servants, and on a bedside locker is a copy of Mythic Dawn Commentaries 1, alluding once again to the servant's deep, dark secret. The Riverview Party is an event held at Riverview from 6pm to midnight every Loredas. At 8pm dinner is hosted for the party guests. Some of the guests do not arrive until 10pm, but all guests are invited to dinner so they will arrive at random times later in the evening. The 6pm party guests include Dulfish gro-Orum and Ohtimbar. The 10pm party guests include Naspia Cosma, Eilonwy, Orintur, and Count Andel Indarys. Two uninvited guests will enter this party. The Count's Bodyguard, who is not invited but will follow the Count inside, and Oghash gra-Magul who will sometimes get stuck looking for Dulfish gro-Orum. † The Count's Bodyguard will follow the Count to the party, even if he is not on the guest list. †† Oghash gra-Magul will often seek out Dulfish gro-Orum and as a result, will crash the party. After the quest The Wayward Knight, Farwil Indarys and Bremman Senyan will stand around outside Riverview. They seem to be waiting for the door to open, as should the lock be opened, they will enter the house briefly before heading off to the Knights of the Thorn Headquarters.